So I’m going to add my mustard (funny German saying isn’t it? Seinen Senf dazu geben… it just means adding your own opinion when discussing something!) to the humongous pile of reviews for this lovely book. 16-year-old cancer patient Hazel is regularly forced to visit a support group at her local church by her parents because they fear that she might be depressed. 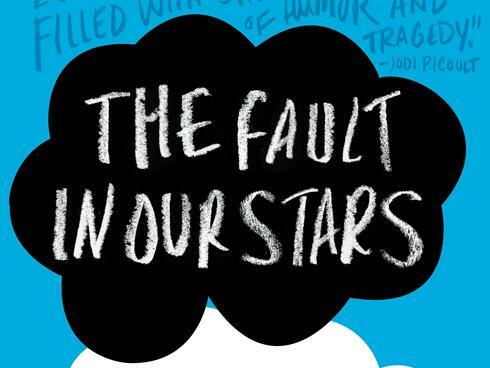 There she meets Augustus Waters who is accompanying his friend Isaac who is suffering from a rare form of eye cancer. He himself conquered bone cancer in his leg and had to have it amputated but he has been “clear” for a year when he meets Hazel. He is very outgoing and he and Hazel Grace, as he likes to call her, soon become best friends after he invites her to watch “V for Vendetta” at his house. In return she tells him about her favorite book “An Imperial Affliction” by Peter Van Houten, that is like a bible to her. Throughout the book they get to know each other better and start dating, they go through cancer treatments together and try to find out more about the mysterious Peter Van Houten. There are lots of emotional highs and lows, especially the end was very touching (believe me, I was in school when I read the whole Augustus-cancer bit and his death and for me it was really sad but I couldn’t let it show in the middle of the school so I didn’t say anything but on the inside I was breaking up…). I don’t usually read quotations at the beginning of books and I didn’t with this one so I went through the whole book thinking “Oh I would love to read “An Imperial Affliction” and then when I finished the book I went back to the start and BAM there it was, A whole quote from AIA 🙂 Loved that little detail! And the answer is YES, you will not regret it one bit! Trivia: I loved that this book was dedicated to Esther Earl. I hope they have a decent bookshop up in heaven so that she gets the chance to read it. And if you don’t know who Esther is, research her and be amazed at the fantastic person that she was. This Star Won’t Go Out!